A holy grail of organic insights for ASO marketers is now available courtesy of Google! 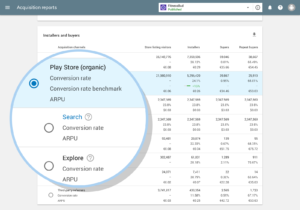 On 8/24/18 the Google Play Console released a massive update with organic acquisition insights for ASO marketers, exceeding parity with Apple's app store browse and app store search source types. 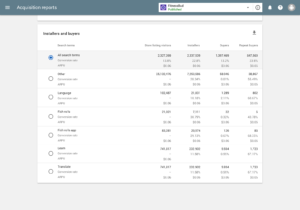 Google achieved parity of Apple's organic acquisition insights by releasing the search acquisition report segment (mimicking Apple's app store search source type) and the explore acquisition report segment (mimicking Apple's app store browse source type). Search: Unique users who found your app on Google Play from search results. Explore: Unique users who found your app on Google Play but not from search results (for example, browsing a category or similar apps cards). 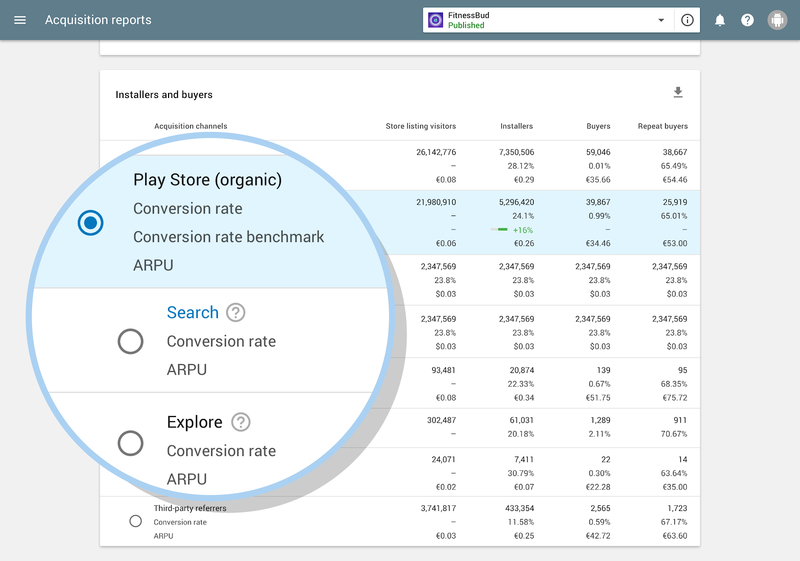 Google made its move following iOS 11, one-upping Apple by beta-testing this new organic insights feature earlier this year with the ability for marketers to see the number of store listing visitors and installers plus retained users and purchase data for the top play store organic search terms. This has long been one of the most sought-after ASO holy grails. The downside to Google's organic acquisition insights is that they don't include every search term (only the most popular) and is only available from 7/30/18 and later. The remaining holy grail for ASO is the number of searches happening per month on each keyword, but with this new organic insights data, ASO tools are more positioned than ever to reverse-engineer the number of monthly searches per keyword by analyzing their customer's organic insights data. 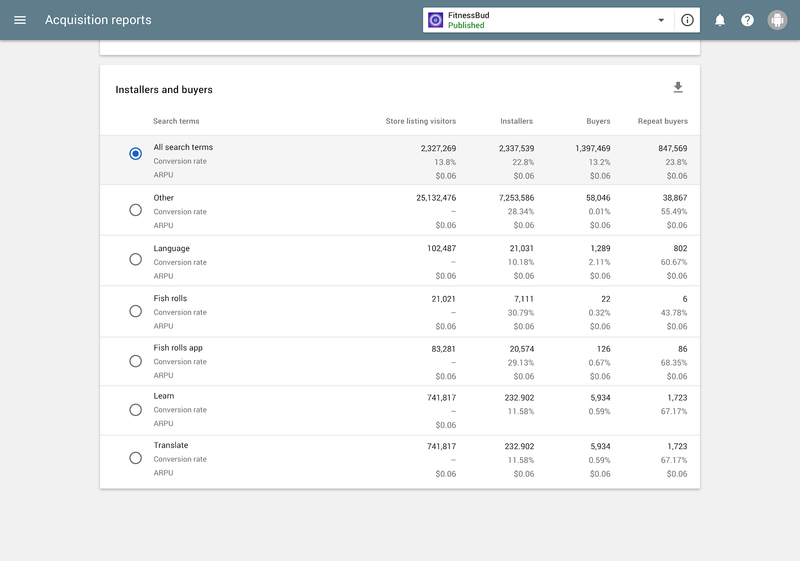 According to Google, the organic acquisition insights update also includes a second crucial update in that the store listing visitor data point will now include store previews. Previously the store listing visit only recorded when a user actually tapped into an app's store listing page, similar to Apple's product page view. This change expands the usefulness of Google Play's store listing visitor and makes calculating true store visibility and install conversion rate more possible than before. The new organic data also includes information about when people visiting the Play Store saw previews of your listings, not just when they visited your full page... People see these previews when they make certain searches, such as searching directly for a brand or app name. As well as more generally in some markets. This new information gives you more visibility into where people see your assets... This change means that your total reported visits and installs are likely to increase as of July 30, 2018. This increase is because previews will be counted as listing views, previously they were included in the category "Installs without store listing visits". One difference between Apple and Google's reports is that Google splits out AdWords campaign traffic into a separate source, which is much preferable to Apple's mixture of true organic and Search Ads conversions, requiring a tedious extra step to get true organic data. Stay tuned to the Incipia blog for more posts exploring uses for this new wealth of ogranic insights. The Bottom Line: Google's organic acquisition insights data is a big blessing for ASO marketers. The additional information also serves to increase the importance of running a targeted ASO strategy as more information is available to marketers and has the potential to grow the performance gap between ASO-optimized and non-optimized Android apps. Eyes are also now on Apple to level the playing field by releasing search term-level organic insights.